Figure 1: The Ebers papyrus was purchased by Ebers the German Egyptologist. It is believed to be one of the oldest medical documents. This papyrus is believed to be one of the oldest medical documents known. It may have been written about 1600 BC. The papyrus is believed to have bee purchased by Edwin Smith in 1862, it is longer than the papyrus termed the Edwin Smith papyrus. The papyrus was bought by the German Egyptologist Georg Moritz Ebers (1837-1898), in 1872. 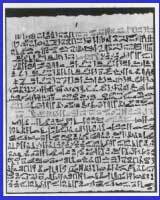 A translation from ancient Egyptian into German was published by Dr. Heinrich Joachim in 1890. Joachim's work was translated from German into English by Dr. Arthur F. Hopkirk in 1903. The papyrus starts with magical spells to protect the physician from supernatural intervention. Diseases of the head, including migraine.